While there are certain things that can’t be achieved outside of a movie studio or soundstage, film locations go a long way in setting the tone of a piece so it’s important that the scenery is right. Sometimes backgrounds need to be dramatic - rolling hills and vast green spaces (think New Zealand in the Lords of the Rings), while other times, a period property is necessary, such as 18th-century Antony House in Cornwall, the location of the opening scenes in Tim Burton’s Alice in Wonderland. Historic buildings are often used in film and TV for their ties to the period in question. Therefore, restoration of historic buildings will always be important to ensure that our heritage buildings don’t lose their striking looks. If historic buildings were allowed to decay beyond repair, it would be a terrible loss, not only to the entertainment industry but to anyone who’s ever looked at a beautiful period building in awe. Alnwick Castle in Northumberland is most recognised as “Hogwarts” from the first two Harry Potter movies and was the background to many memorable scenes, from Harry learning to ride a broomstick to the Quidditch games that took place at the school. 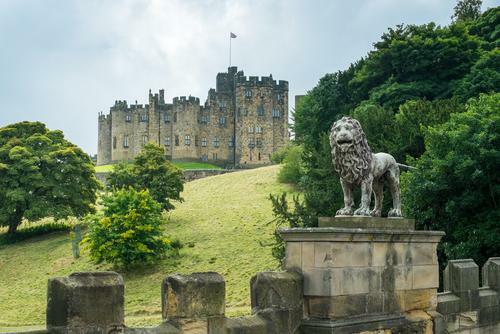 Alnwick Castle is open to the public where visitors can experience some traditional castle life and activities such as artisan craft making and sword juggling shows. Fans of the Harry Potter movies can even take part in a training session to learn “how to ride a broomstick” in the very spot where Harry had his first lesson. An architectural masterpiece, the Royal Naval College in Greenwich has been featured in many a blockbuster, including Les Misérables, The King’s Speech and The Golden Compass. The incredible Chapel and Painted Hall are also recognisable from recent Marvel movie Thor: The Dark World. The site of the Royal Naval College has been in use for centuries. Starting as the Palace of Placentia, the site was converted to the Greenwich Hospital. It was then used as a training site for the Royal Navy before finally being taken over by the Greenwich Foundation for the Old Royal Naval College. First dating back to AD 672, the original building was created when St Etheldreda built an abbey church on the location, Ely Cathedral is one of the UK’s oldest sites. Today's cathedral was constructed in 1083 and is an exceptional piece of architecture that deserves to be admired. Ely Cathedral was chosen to represent Westminster Abbey in The King’s Speech but has also featured in The Other Boleyn Girl and Elizabeth: The Golden Age. While it’s not difficult to see why these incredible locations were featured in the movies, it’s equally important that all historic buildings and sites are protected. Ensuring that they are around for future generations to enjoy, historic buildings also give us an incredible insight into what life was like in the past. If you have any questions on the restoration of heritage buildings or would like to enquire about our building repair service, please contact our team on 01733 560362.